Prepare for the November 3rd elections and discover which candidates will make public education the number one priority in Loudoun County. The Board of Supervisors sets local tax rates and approves the county budget, including the amount to fund the Loudoun County Public Schools. 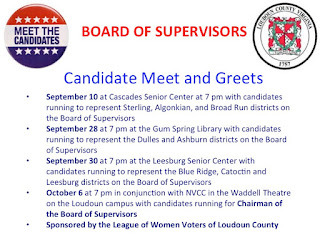 There will be four meet and greets open to the public and hosted by the League of Women Voters of Loudoun County with candidates for the Board of Supervisors. Questions from the audience are invited, and the forums will be moderated by local media representatives. 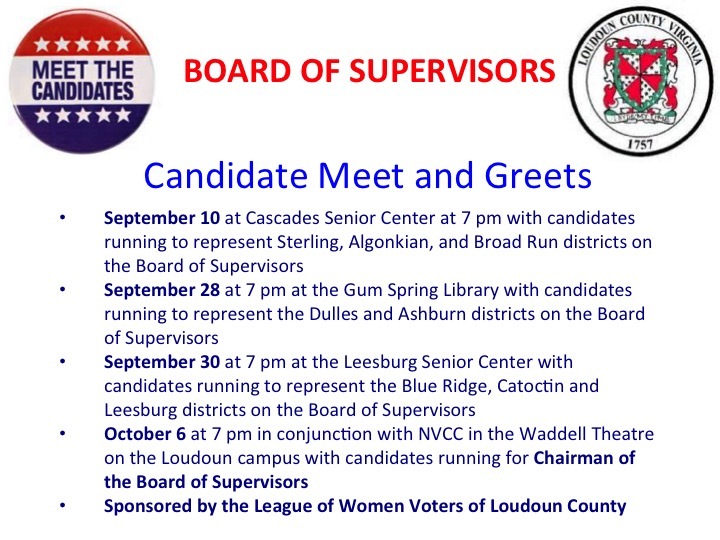 The press release about the meet and greets is available at http://www.loudoun.va.lwvnet.org/files/2015electioneventsnewsrelease.pdf. Mark your calendar, attend the meet and greets, and identify the candidate who makes public education their number one priority.